We like the long clay pipes. 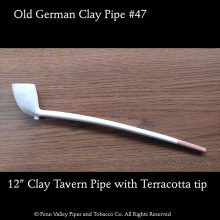 Are they clay churchwardens or clay tavern pipes? They can be categorized as both. The long stem places them squarely in the camp of churchwarden. The same long clay stem puts them in the colonial pubs and taverns making them tavern pipes. 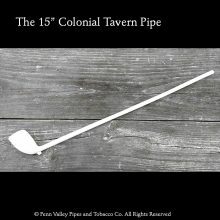 Tavern pipes would have been found in the public houses (pubs) and taverns of England and Continental Europe as well as colonial North America in the 1700s and 1800s. Kept in the tavern rather than brought in by the patrons, the pipe would go from smoker to smoker with a bit of the stem broken off to provide a fresh pipe for the next patron.